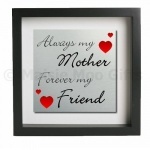 A personalised glass chopping board with our popular Apple Blossom Family Tree design. 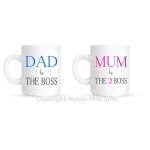 A twin gift mug set including ad Is The Boss & Mum Is The Real Boss mugs. A pair of sterling silver cocktail glass earrings on a personalised metal gift card. Complete in tin gift box. A personalised toiletry wash bag with a animal print design. A canvas style polyester apron personalised with a cupcake design. A pair of sterling silver moon earrings on a personalised metal gift card. Complete in tin gift box. Available for a choice of relations. A polyester apron personalised with a hearts Best Mum design. 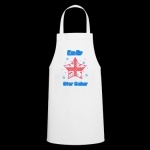 A polyester apron personalised with a shabby chic style star baker design. A personalised metal wine bottle stopper thank you gift for a bridesmaid. A personalised metal wine bottle stopper thank you gift for a witness. A personalised metal wine bottle stopper thank you gift for a maid of honour. A personalised metal wine bottle stopper thank you gift for a mother of the bride. A personalised metal wine bottle stopper thank you gift for a mother of the groom.